Once again, you, my readers, have come through with some really high-grade crackpottery. This one was actually sent to me by its author, but I didn’t really look at it until several readers sent me the same link because they thought it was my kind of material. With your recommendations, I took a look, and was rewarded. 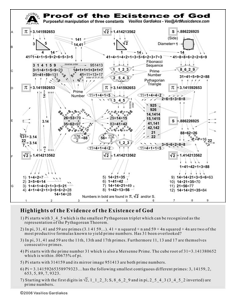 In a moment of hubris, the author titled it A Possible Proof of God’s Existence from Multiverse Assumptions. This article is basically a version of the classic big-numbers probabilistic argument for God. What makes this different is that it doesn’t line up a bunch of fake numbers and saying “Presto! Look at that great big probability: that means that it’s impossible for the universe/life/everything to exist without God!”. Instead, it takes a more scientific looking approach. It dresses the probability argument up using lots of terms and ideas from modern physics, and presents it as “If we knew the values of these variables, we could compute the probability” – with a clear bias towards the idea that the unvalued variables must have values that produced the desired result of this being a created universe. Aside from being an indirect version of the big-numbers argument, this is also a nice example of what I call obfuscatory mathematics. See, you want to make some argument. You’re dead sure that it’s right. But it doesn’t sound convincing. So you dress it up. Don’t just assume your axioms – make up explanations for them in terms of math, so that it sounds all formal and mathy. Then your crappy assumptions will look convincing! With that said, on to his argument! This entry was posted in Bad Physics, Bad Probability, Debunking Creationism on July 31, 2008 by markcc. to see the other players strategy before selecting their own; and so on. strategy before selecting his own. Perhaps the game isn’t zero-sum. zero-sum games often simply don’t work once you relax the zero-sum requirement. for a given player at any point in time is the set of open squares on the board. Each time a player makes a move, the game is altered for the other player. that a player can make creates a new game for the other player. 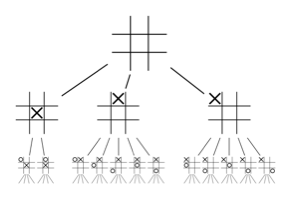 By making each game position a tree node, and adding children nodes for each position that can follow it, you can build a tree describing the complete set of possible game positions, and thus the complete set of ways that the game could play out. This entry was posted in Game Theory on July 30, 2008 by markcc. Teaching Multiplication: Is it repeated addition? been going on about math education, particularly with respect to multiplication. In general, I’m mostly inclined to agree with him, with some major caveats. But since he sidesteps the real fundamental issue here, I’m rather annoyed with him. This entry was posted in Math Education on July 25, 2008 by markcc. There’s one kind of semi-mathematical crackpottery that people frequently send to me, but which i generally don’t write about. Given my background, I call it gematria – but it covers a much wider range than what’s really technically meant by that term. Another good name for it would be numeric pareidolia. It’s been a long time since I’ve written about this kind of stuff, and someone just sent me a pretty typical example, so what the hell. It revolves around a mess that he put together as an image, which is pretty much a classic example of obsessive silliness. is the third kind – it’s written by a guy who believes that there are mystic secrets encoded into π and the square root of two that were put there by God, and that the existence of those patterns are proof of the existence of God. all sorts of patterns, then you can find patterns in absolutely everything. The question that you need to ask is whether or not the pattern is simple the result of our ability to find patterns in noise, or whether it’s something deliberate. This entry was posted in Numerology on July 24, 2008 by markcc. the matrix are given by something called a utility function. simple, but as usual, we’ll make it all formal and explicit. This entry was posted in Game Theory on July 21, 2008 by markcc. The Flower Kings, “Underdog”: a neo-progressive track with the lead played by a bagpipe and a steel guitar. How can you not love that? track with vocals. Very good stuff – very dense. Like I said it’s got vocals, but they’re not the dominant part of it – they’re actually almost in the background. Marillion, “Heart of Lothian”: a track off of my favorite Fish-era Marillion album. It’s hard to take this in isolation – the whole album is really one continuous piece of music – with recurring themes, lyrical motifs, etc. This is really just a continuation of what came before it – it’s not a standalone. But it’s amazing – the kind of music that can give you chills even the hundredth time you’ve listened to it. and who knows what else. Amazing, dazzling stuff. understand it enough to enjoy it. But like modern classical music, it’s worth the effort. This group is really one of the most amazing ensembles in progressive rock. Happy the Man, “Stepping Through Time”: a piece off of the reunion album of the great american progressive band. I’m a huge fan of HtMs old work. This new album isn’t bad – it’s interesting, complex music, with nice melodies, time changes, and amazing musicianship. But it’s strangely lacking something. It’s soulless. It just feels very mechanical. Isis, “All Out of Time, All Into Space”: more post-rock. Very atmospheric, dark. is a straightforward traditional Irish showoff piece. Bouncy fun that makes you want to get up and dance. experimental studio clips. It sounds like Sonic Youth playing post-rock. stuff from early Hawkwind. Depending who you ask, this is either early progressive or psychedelia. This entry was posted in Music on July 18, 2008 by markcc. a while, I’ll take a moment and refresh your memory a bit. an entry of $50 means that B has to pay $50 to A; an entry of $-50 means that A has to pay $50 to B.
choose a strategy each iteration is called a grand strategy. Jon Von Neumann proved that for any two-player zero-sum game, there is an optimal grand strategy based on probability. In a game where both players know exactly what the payoffs/penalties are, the best strategy is based on constrained randomness – because any deliberate system for choosing strategies can be cracked by your opponent, resulting in his countering you. The best outcome comes from assessing potential wins and losses, and developing a probabilistic scheme for optimizing the way that you play. formulate the game as a linear optimization process, it just seems completely obvious. This entry was posted in Game Theory on July 16, 2008 by markcc. movie, and knowing how badly a lot of popular science stuff really screws up the math. Little did I know what I was getting into…. After signing up for the review, his production company mailed me a DVD at the beginning of the month. The packaging makes it clear that what I saw is not the final version of the movie. The soundtrack, color balance, and editing are all likely to change before the real final cut of the movie, so what I saw is definitely a preliminary version. Finally, last weekend, I sat down to watch it. I don’t think Randy is going to be terribly happy with this review, because I really didn’t like it. From the title, you might think that it’s a movie about global warming. It’s definitely not that. At times, it wants to be a movie about the debate over global warming. But it doesn’t succeed at that. And at times, it wants to be a straightforward comedy. But it doesn’t even succeed at that. It does a dreadful job of balancing those different goals. It comes off as a mean-spirited, glib, pointless mess of a movie. This entry was posted in Chatter on July 15, 2008 by markcc. So my fellow SBer PZ is in all sorts of hot water with Catholics over a blog post. I didn’t really want to poke my nose into this, but there’s been so much noise about it, that it’s really unavoidable. But I think I’ve got a rather different opinion on this than most bloggers I’ve seen so far. And I’m pretty sure that I’m not going to be making any friends by posting this. But people keep asking, so I’m going to open my big mouth, and tell you what I think. You see, I think that both sides are assholes. Obviously, the people making threats take the prize as the biggest assholes, but a huge margin. But this isn’t a situation where a bunch of wackos went on an unprovoked rampage against a blogger; PZ deliberately provoked this mess. This entry was posted in Chatter on July 14, 2008 by markcc. Another cool, but frequently overlooked, data structure in the tree family is called the B-tree. A B-tree is a search tree, very similar to a BST in concept, but optimized differently. Why would you design it that way? It’s a different performance tradeoff. goal for performance in a B-tree tries to minimize disk access; and when disk access is necessary, it tries to localize it as much as possible – to minimize the number of retrievals, and even more importantly, to minimize the number of nodes on disk that need to be updated when something is inserted. This entry was posted in Data Structures on July 6, 2008 by markcc.